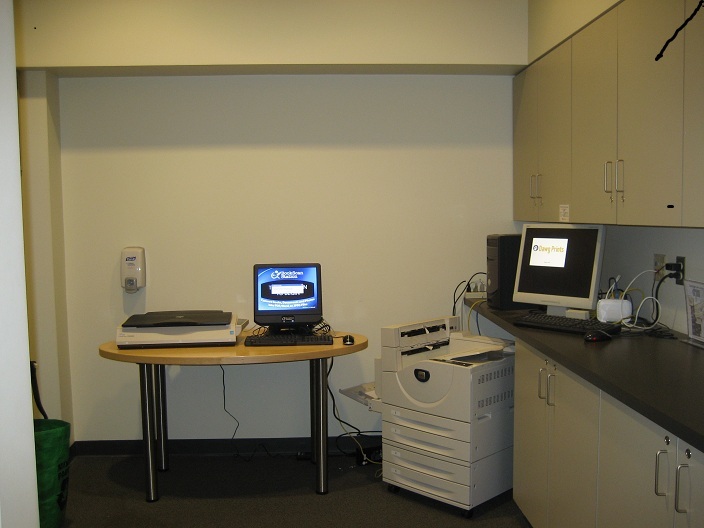 The Law Library has printing stations, book and document scanners, and a microfiche/film reader/scanner. Photocopiers are no longer available. To make a copy from pages in a book, use one of the book scanners and then print the scanned images (or download them to your own USB drive or send via email). Where: Book scanners and printers are in the Copy Alcoves in the Reference Area and behind the Bogle & Gates Student Lounge on Floor L1. Scanning: Scanning is free. From the scanners, you can save a document to a thumb drive, to your smart phone, or email it. Dawg Prints Dispenser where you can use cash to purchase a Dawg Prints Card or add value to your Dawg Prints Card or Husky Card is in the Copy Alcove next to the Bogle & Gates Law Student Lounge. Book scanner and printer workstation. The printers accept only UW Husky Cards and Dawg Prints cards. Printouts cost 12₵ per side of the paper for black and white, 75₵ for color. Add money to your Husky Card online . Purchase a Dawgprints card from the machine in the L1 Copy Alcove by the Student Lounge. The card costs $.20 but can be reused and reloaded with additional cash. Add money to your Dawgprints card using the machine in Copy Alcove by the Student Lounge. Failure to logout will allow the next user to make copies at your expense! Find the item that you wish to print. Click on the Print icon at the top of the screen OR from the menubar, click on File, then Print. Select "Gallagher Law Library - BW" to choose the black and white printer ("Gallagher Law Library - Color" for the color printer). Click "next" to indicate that you want the document to print double-sided. In the popup window, type your name and a short name for your document. Go to one of the Copy Alcoves on L1 and swipe either your Husky Card or Dawg Prints card through the card reader attached to the adjacent keyboard. Select your print job from the list. If the printer has not been used recently, there will be a short delay as the printer warms up. The cost of the copy will be deducted from the Husky Card or Dawg Prints card. Print requests are stored in the pay-to-print system for 24 hours. If you don't make your print-out within 24 hours, it will be deleted from the list. Ask a reference librarian or the Circulation staff for assistance. Go to the DawgPrints Printer Location site. Download the driver: Click the appropriate operating system link (e.g., "Mac OSX" for Macs). Install the software: Be sure to allow popups from the Dawgprints site, save the software to your computer, and install it. Problem: tried to download the drivers but something's not working! What do I do? Visit the DawgPrints troubleshooting page for some suggestions. If you still can't fix the problem, email Creative Communications. The Law Library has two printers, both on L1. You can go to either printer station to initiate the print job after you have sent a document to the printing system. One is in the Reference Area, next to the Circulation Desk. The other is next to the Law Student Lounge. You can view and/or scan microfiche/microfilm on the Scanpro workstation near the Circulation Desk. Detailed instructions on scanning materials to your email and/or printing are located at the workstation. Please ask for assistance at the Circulation Desk or Reference Office. We have three overhead book and document scanners in the Copy Alcoves on L1 and in the Bogle & Gates Law Student Lounge. There is no cost for using the scanners, but you need to have a UW NetID to email scanned images. Visitors should register for a NetID at the Circulation Desk. Follow the step-by-step instructions displayed on the monitor attached to the scanner. You can copy scanned images to a USB (thumb) drive or email them. Note that some PDF files are quite large and may exceed the capacity of some email providers. Please note that there is a 15-minute time limit on using the scanners. The time limit ensures that anyone who needs to scan a document can do so without encountering a long wait time. Scanned documents may now be printed in color on the printer in the Copy Alcove near the Law Student Lounge. Color copies cost 75₵. Ask for assistance at the Circulation Desk or the Reference Office.